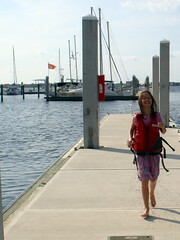 The other afternoon I had to pick C. and I. up from sailing. 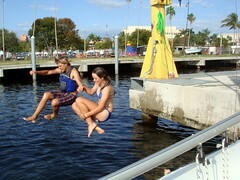 When the other kids and I got to the sailing center a few of the sailors were jumping off the dock and into the river. 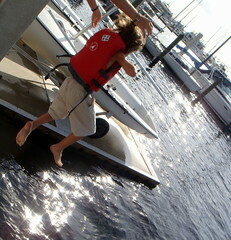 I. was one of those energetic young men, running down the long concrete dock and doing tricks into the water 6 feet or so below. And, even though everyone else was packing up and heading home, he did not want to leave. We had no plans, no place we had to be, I couldn't see any reason to be in a hurry to go anywhere. 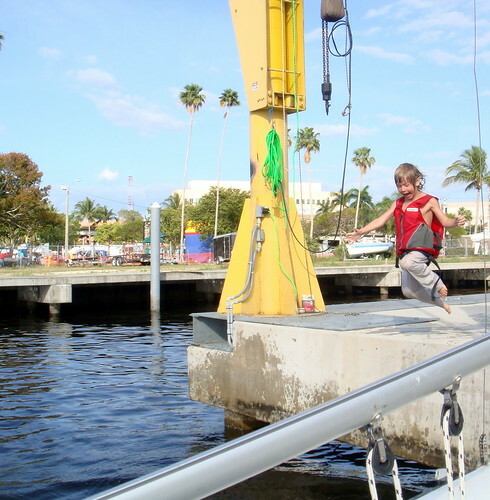 I suggested that the three younger kids grab some life jackets and jump in (the sailors, no matter what age, always have their life jackets on on the docks ... except for one girl, one time, as you can see in the pictures ... she's a rebel and she's mine LOL). They looked at me like I was nuts, completely nuts. Because they were not in bathing suits. They were, in fact, in their church clothes. No way, no how were they going swimming in their clothes! People don't do that! Until a teenaged girl jumped in in her clothes - blue jeans and all. It suddenly dawned on them that, while very strange and unheard of, it might not be the worst thing ever to swim in pants or even in a pretty pink skirt. So they grabbed some very big life jackets. And hesitated ... hemming and hawwing about whether or not they were really going to do this. And then big sister started tossing them in. They did complain about that for a second but it was kind of hard to take them seriously when they were laughing so hard they could barely speak. After that they jumped. And jumped. And laughed and screamed. And never looked back. And they threw jellyfish at each other (gross, if you ask an old Mama like me ... but they get a kick out of tossing the slimy gooey things at each other). And they jumped, and jumped, and swam for almost two hours ... long after everyone else had gone home, long after dinner should have been on the table, long after their skin was pruney. And every one of them (5 of mine and a friend of C.'s) had a great time and said they were so glad we'd stuck around and played, and that they hoped we'd do it again sometime. Yes, my teenager admitted that she had had fun with her family (and it didn't hurt that the friend was there!). My boys have been asking every day to go back ... I'm afraid I've created some clothes wearing swimming monsters. I have to admit that I did not jump in. 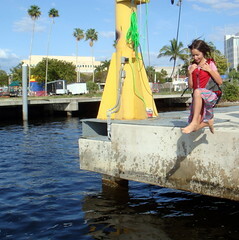 I was really tempted, very tempted by the tall dock and the tricks, and the feeling of freedom that would come from throwing caution to the wind, but I had a fussy little R. to take care of and couldn't very well take him in with me. Next time? I hope so! My challenge to myself and everyone else is to "just do it". Encourage yourself and your kids to jump into a river with clothes on, dance in the rain, jump out of the car along the highway to grab a few bits of cotton ... embrace the moments and the opportunities that you never saw coming, whether you are prepared for them or not, whether they are practical or not, whether they are convenient or not. Instead of quickly saying "no" to the slightly irrational throw caution to the wind and just say "yes" for the heck of it. You'll feel great for doing so and, if you have the opportunity to involve kids, they'll remember it forever. I plan on taking your advice! I loved reading that and will try to put a little more spontaneity in our life. I have two boys who will love that. Thanks for sharing!